Waterford is the most dangerous division for gardaí, with officers six times more likely to be assaulted in the line of duty than in the safest garda division, Wicklow, according to a data analysis by RTÉ Investigates. For all injuries, including assault, gardaí in Waterford were three times more likely to suffer an injury than in Dublin North Central, the safest garda division in this category. The analysis was based on data released under freedom of information and shows that geography has a significant bearing on the injury rate and assault rate for gardaí. Somewhat counter-intuitively, the more dangerous divisions in terms of injuries sustained are not necessarily the urban settings of inner-city Dublin, Limerick or Cork, but include larger rural counties such as Kerry, Donegal and Tipperary. 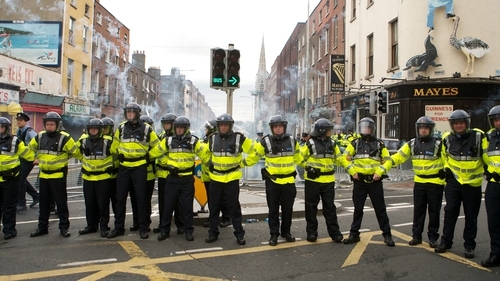 "Gardaí will inevitably get injured"
"Gardaí face significant and serious danger when performing their duties and as a result, a number of gardaí will inevitably get injured," according to An Garda Síochána. An Garda Síochána records injuries under a number of headings, including "assault," "manual handling," "needle stick injury," "psychological shock or trauma," "road traffic accident," "slip/trips/falls" and "injured by animal." Those records were compiled according to garda division, one of the organisational units in An Garda Síochána. In most cases, those divisions correspond to counties, except for a number of smaller counties, which are amalgamated together in pairs. Dublin and Cork are also sub-divided into a number of divisions. While the number of gardaí dropped during the recession because of a freeze in recruitment which ended in 2014, in more recent years, Garda numbers have increased. On average, the annual number of serving gardaí in regional divisions was around 11,000 for 2012-17, during which time there were around 3,200 injuries recorded. The map below shows the variation in garda divisions according to recorded injuries, per 100 gardaí, from 2012-17. Waterford: The most dangerous assignment? Waterford is the most dangerous division in terms of injuries sustained. It recorded 59 injuries per 100 gardaí, over the six years under review, while Dublin North Central had the lowest injury rate, with 19 per 100 gardaí. Across all regional divisions, the average number of injuries per 100 gardaí was 29. It may seem surprising that Dublin North Central, which has a reputation for anti-social behaviour, drug problems and social disadvantage, is the safest division for gardaí using a per capita measurement. But this could be explained by the fact that there are far more gardaí in this division, which dilutes the per capita injury rate downwards, relative to other, less urban divisions. It is also possible that in more urban divisions, where there is a greater concentration of gardaí, there is quicker backup available to police officers who find themselves in danger. Kerry, meanwhile, was the next highest on the injury list in per capita terms, while Tipperary was in third place. Both of those counties are relatively big and rural. Although Dublin North Central was relatively safer for gardaí, their neighbours in Dublin West were not so lucky. This was the third highest on this list, on 41 injuries, a position it shared with Tipperary. The category listed as "other" includes relatively uncommon occurrences, such as psychological trauma, injuries caused by animals (of which there were a total of 41 over the six-year period under review), as well as other unspecified injuries. Assault is the most common form, accounting for 45% of all injuries sustained. In total numbers, from 2012-17, this represents almost 1,500 assaults. In terms of assaults solely, the most violent garda division on a per capita basis was also Waterford, which recorded 38 assaults for every 100 of its gardaí from 2012-17. Wicklow was the least violent, with just six assaults per 100 gardaí, while Limerick was the second safest, with just seven. "No legal consequences for the perpetrator"
The representative body for rank-and-file gardaí, the Garda Representative Association (GRA), said that it believes that the number of assaults against its members is grossly under-reported. "Bites, grazes, and bruising are the most common injuries suffered by gardai on duty and these are rarely, if ever reported," said GRA spokesman John O’Keeffe. Mr O’Keeffe said that gardaí fail to report their injuries because "they know there will be no legal consequences for the perpetrator." It is difficult to quantify the annual number of convictions recorded for assaults against gardaí. Where an individual is prosecuted, it is usually under the same legislation relating to assaults against civilians, including assault under section 2 of the Non-Fatal Offences Against the Person Act, 1997, and assault causing harm, under section 3 of the same Act. A section 2 assault can result in a prison sentence of up to six months, while assault causing harm can result in a five-year sentence. The GRA has proposed that a section 2 assault against a garda should result in a minimum sentence of six months, while assault causing harm should carry a one-year minimum sentence.